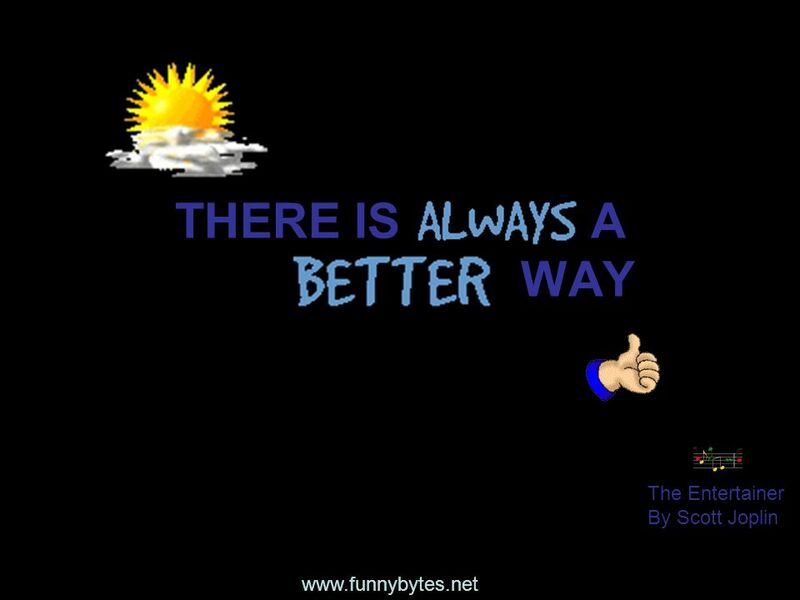 www.funnybytes.net THERE IS A WAY The Entertainer By Scott Joplin. 4 www.funnybytes.net A man was walking by. 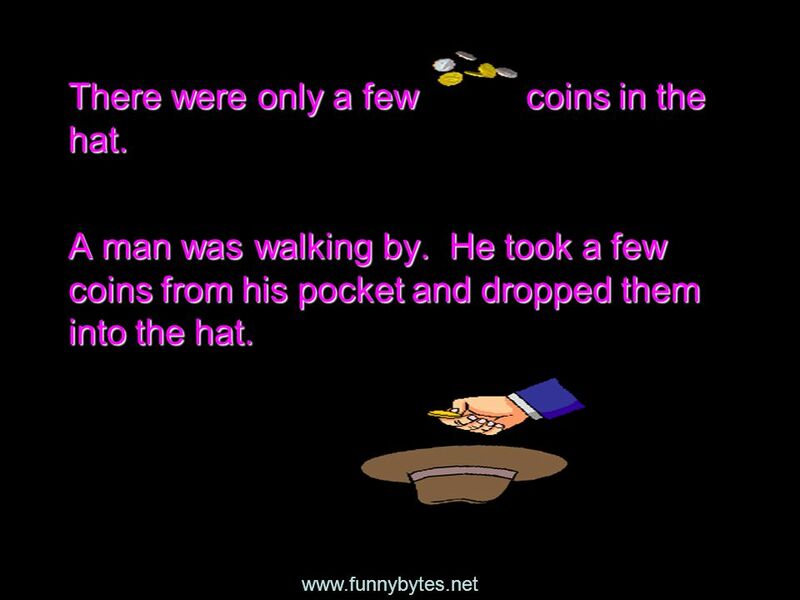 He took a few coins from his pocket and dropped them into the hat. There were only a few coins in the hat. 5 www.funnybytes.net He then took the sign, turned it around, and wrote some words. He put the sign back so that everyone who walked by will see the new words. 6 www.funnybytes.net Soon the hat began to fill up. A lot more people were giving money to the blind boy. 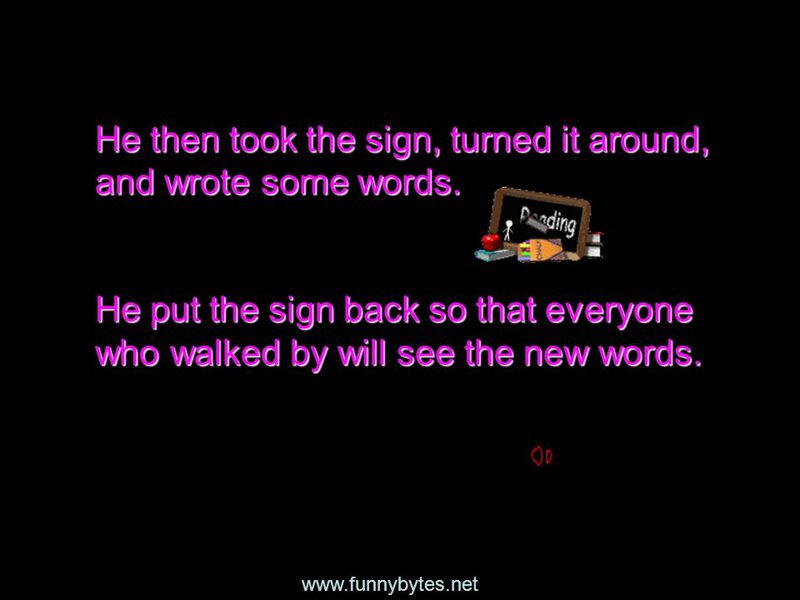 7 www.funnybytes.net The boy recognized his footsteps and asked, ”Were you the one who changed my sign this morning? 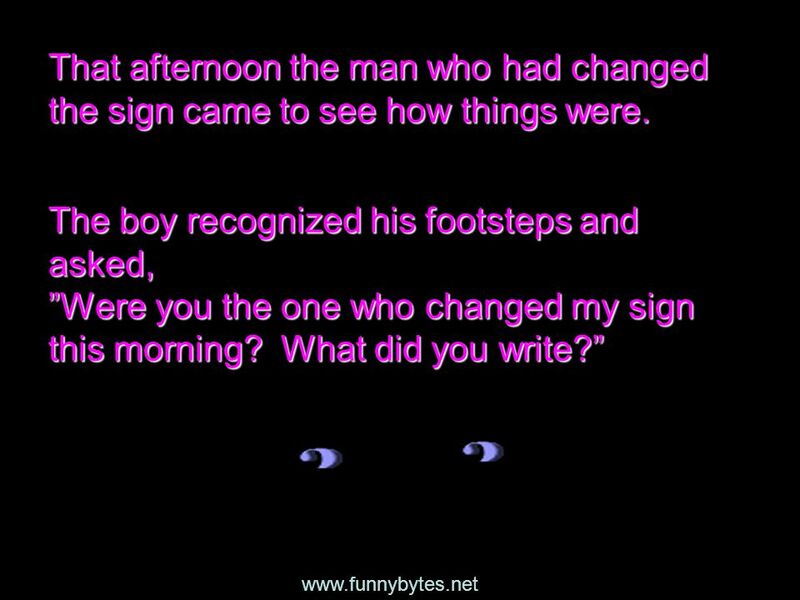 What did you write?” That afternoon the man who had changed the sign came to see how things were. That afternoon the man who had changed the sign came to see how things were. 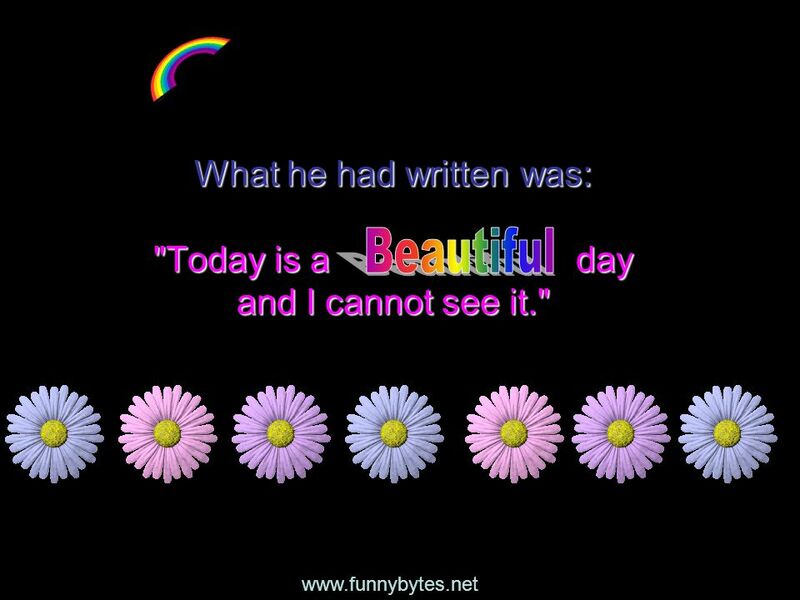 9 www.funnybytes.net What he had written was: "Today is a day and I cannot see it." 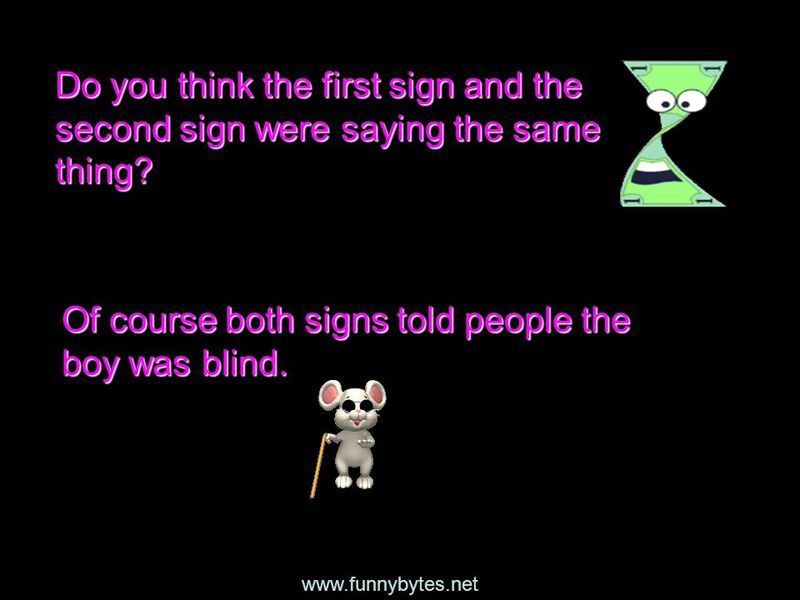 10 www.funnybytes.net Do you think the first sign and the second sign were saying the same thing? 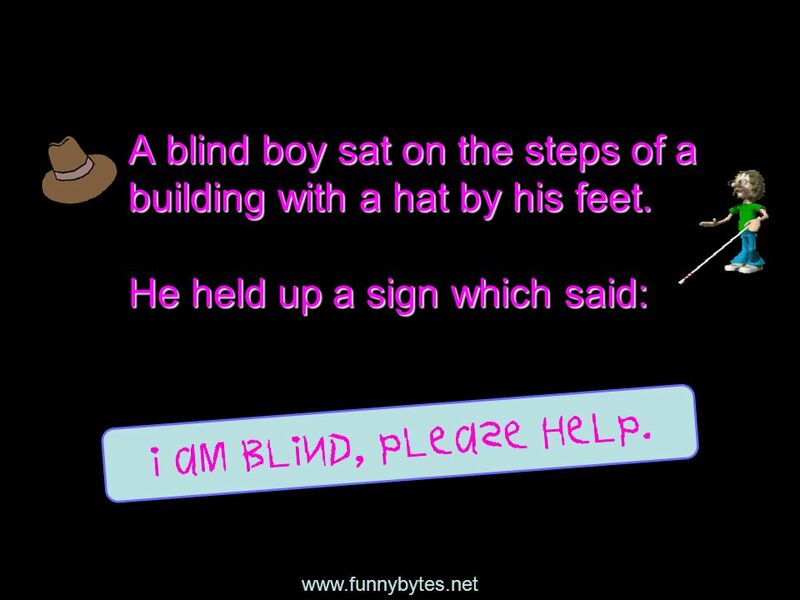 Of course both signs told people the boy was blind. 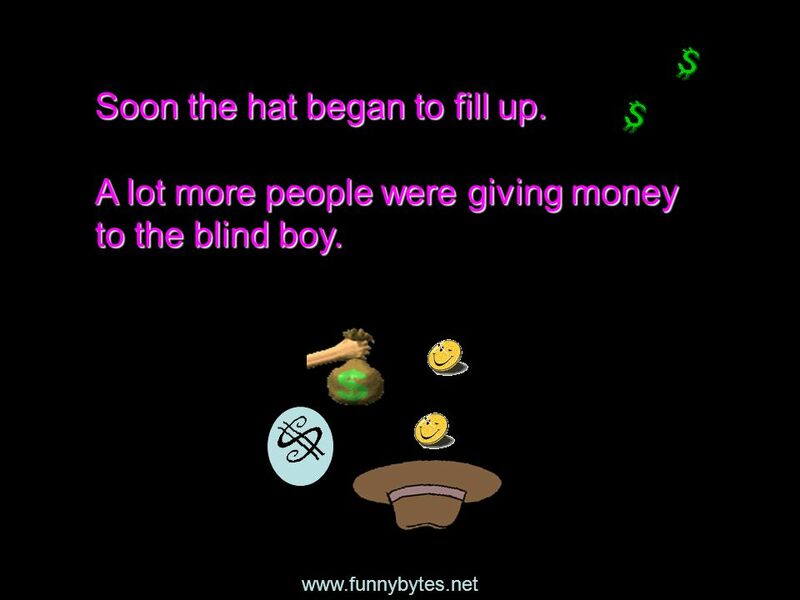 11 www.funnybytes.net But the first sign simply told people to help by putting some money in the hat. 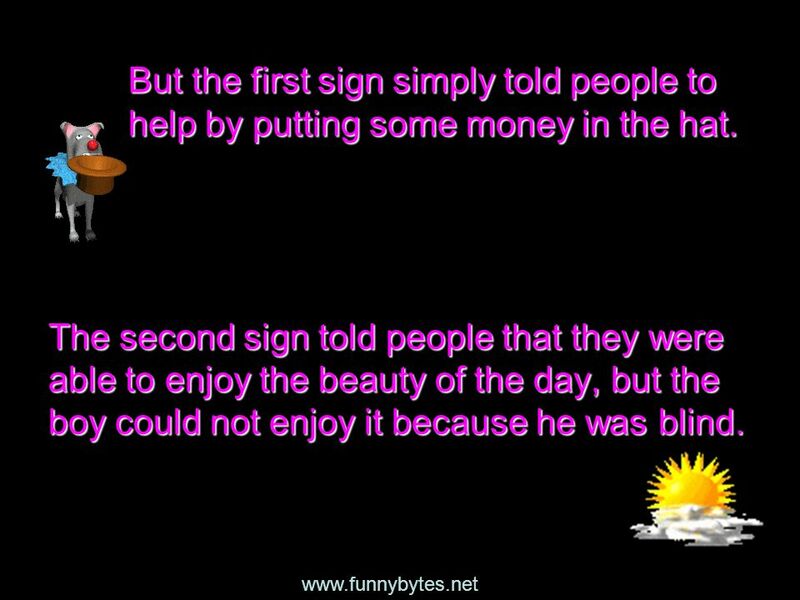 The second sign told people that they were able to enjoy the beauty of the day, but the boy could not enjoy it because he was blind. 12 www.funnybytes.net Should we be surprised that the second sign was more effective? 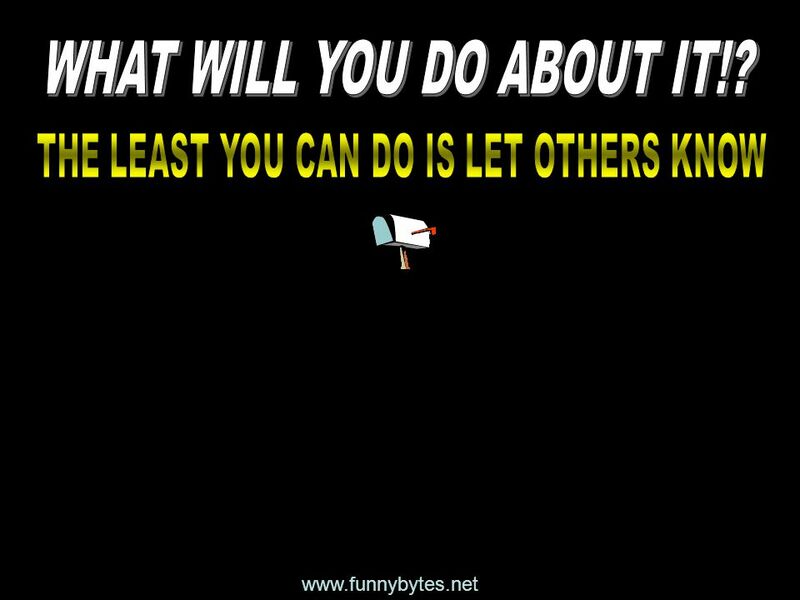 13 www.funnybytes.net There are at least two lessons we can learn from this simple story. 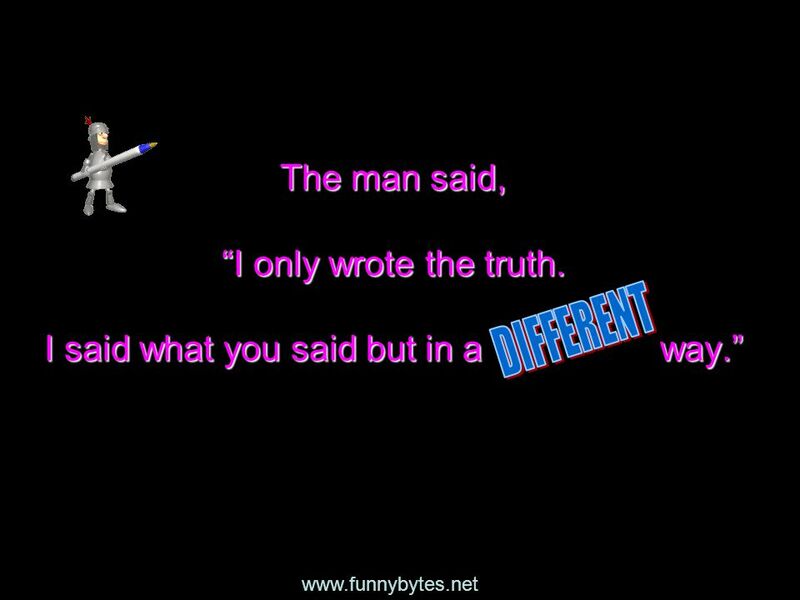 Download ppt "www.funnybytes.net THERE IS A WAY The Entertainer By Scott Joplin." LO: To know about the work of a Christian organisation that supports others. ♫ ♫ The story of the blind girl is very touching indeed! There was a blind girl who hated herself because she was blind. She hated everyone, except her. Welcome Yeshua’s Yeladim We Love You! Please Remember These Rules Please don’t talk when others are talking. Please raise your hand if you would like. THERE IS A WAY The Entertainer By Scott Joplin. PUTTING FIRST THINGS FIRST The Whistle Today’s Questions 1. What book of the Bible is today’s lesson from? 2. What did Ben learn? 3. How can I use this. Empowering Compassion. Week #4 The power of the Kingdom. An Outsider No More! Acts 3:1 – 4:4. Mission: Make disciples of all nations Means and goals: Going  witnessing/proclaiming Baptizing  belonging Teaching. Wednesday 28 th February To explain the events of the Last Supper To write a diary entry explaining the feelings of one of the disciples. 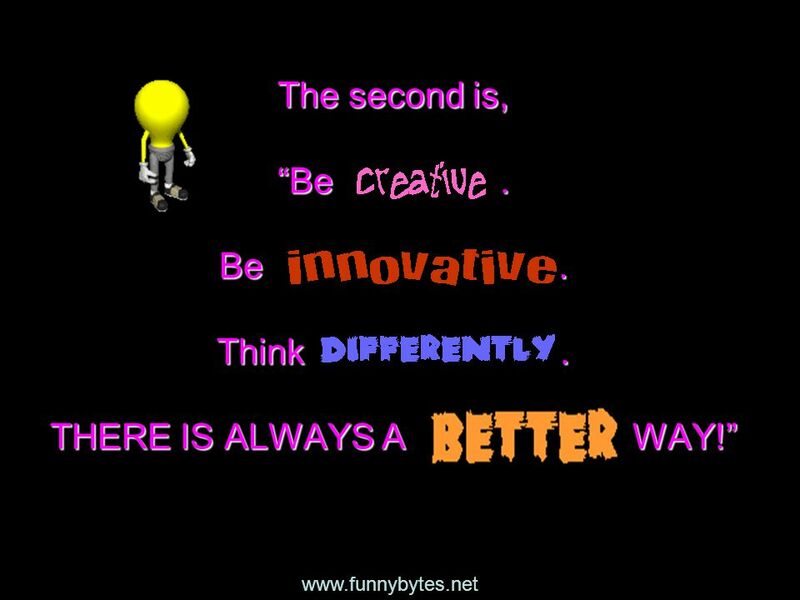 Second thoughts… Click on…. A young man, a student in one of the universities, was one day taking a walk with a professor, who was commonly called the.